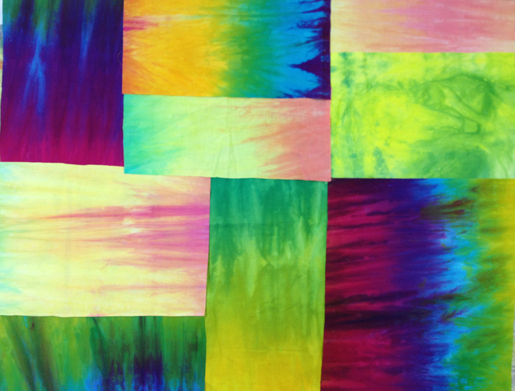 Laura Wasilowski is a textile artist, author, teacher, and creator of hand-dyed fabrics and threads. 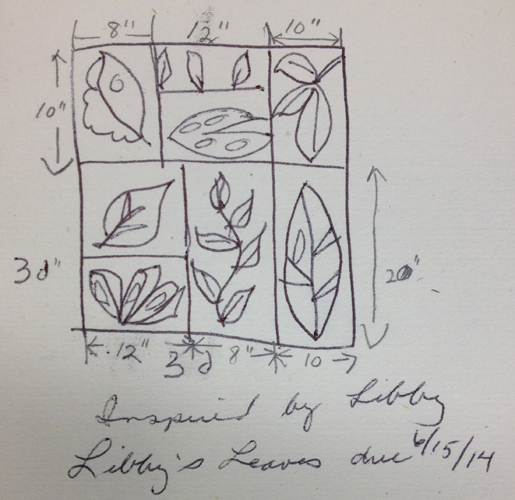 Last fall I was invited to create a quilt for a special exhibit called Inspired by Libby. Many of you know Libby Lehman from her international teaching or as a top-notch BERNINA Ambassador. She has inspired us all with her beautiful artwork and great sense of humor. But recently Libby has had some medical problems. So when asked to make an auction quilt to help her family with medical expenses, I was right on board. 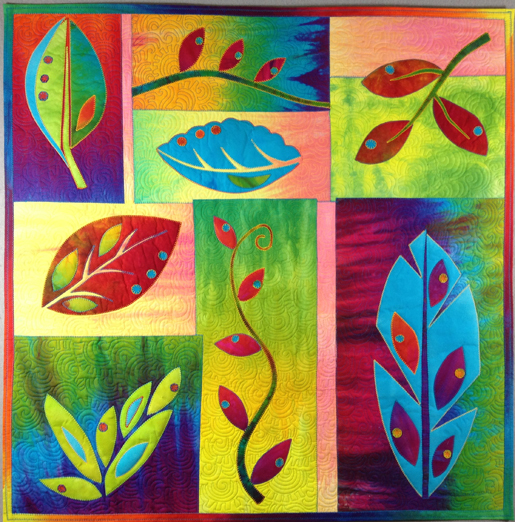 The layout for my Inspired by Libby quilt comes from her lovely quilt called Leaves in Living Color. 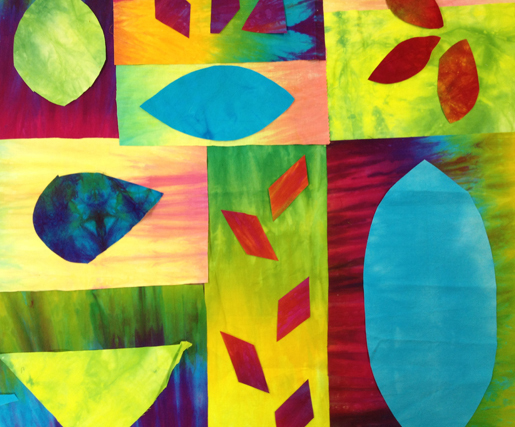 In that quilt, Libby made different sized panels or blocks that join together in a really pleasing composition. My first step is to sketch my own design using a similar layout with leaves as the dominate design element. My next step? Select a color palette. As both a dyer and a fuser, my stash includes hand-dyed fabrics in a vast array of color ways and pre-fused fabrics left over from other projects. After choosing fabrics for the background blocks, I cut them to size and fuse them together to make a 30″ x 30″ foundation for the design. Do the colors flow and repeat themselves around the piece? Is there a variety of scale of design elements? 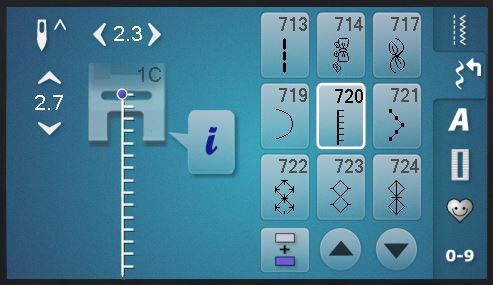 Do the design elements repeat themselves? Is there enough contrast so shapes are distinct? And most importantly, does the design engage the viewer? Once the quilt top is complete, it is steam set to the batting. Then the fun of machine quilting begins. 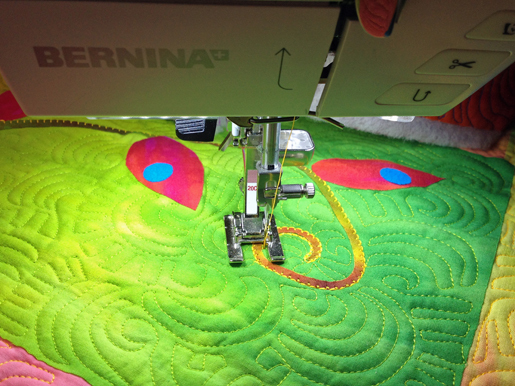 My BERNINA 750 QE makes stitching a breeze as each element is edged with my favorite decorative stitch, blanket stitch #720. You can see the entire collection of Inspired by Libby Quilts on display at the International Quilt Festival in Houston late October, 2014. At the show, two of the quilts will be selected for a silent auction. Later the entire collection will be available as an online auction for you to bid on. All of the monies raised from the sale of the Inspired by Libby Quilts will be given for her care. It was Libby Lehman who introduced me to the wonderful world of BERNINA sewing machines. And that’s why I’m so happy to be included in the Inspired by Libby invitational. 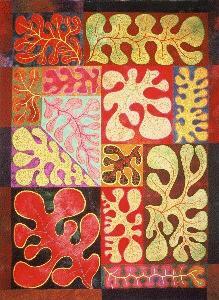 I hope you have an opportunity to view the quilts and bid on them too! Visit Laura at her ArtFabrik blog and website. To see more of Libby’s quilts, click HERE to join Alex Anderson on a video tour of the Libby Exhibit in Houston, 2013.